For 2004, the Ford Mustang celebrates its 40th birthday with a 40th Anniversary package, that's a no-cost option on V6 and V8 models. The 40th Anniversary Package adds exterior and interior upgrades to V-6 and GT models. All model also receive improved sealing for reduced windnoise, while convertibles are available with an upgraded Medium Parchment soft retractable top that�s more durable and sound resistant. 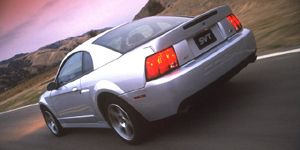 The 2004 Ford Mustang Coupe is powered by a base 3.8-liter V6 with 193 hp. Other available engines include a 4.6-liter V8 with 260 hp, a 4.6-liter V8 supercharged with 390 hp and a 4.6-liter V8 with 305 hp. The 2004 Ford Mustang Convertible is powered by a base 3.8-liter V6 with 193 hp. Other available engines include a 4.6-liter V8 with 260 hp and a 4.6-liter V8 supercharged with 390 hp. Find the used Ford Mustang of your choice from a dealer in your area. Search our used car listings now.